It is ages since I last blogged, but actually found time to make a card tonight! I used one of the new Kanban stamps from their vehicle/transport collection. 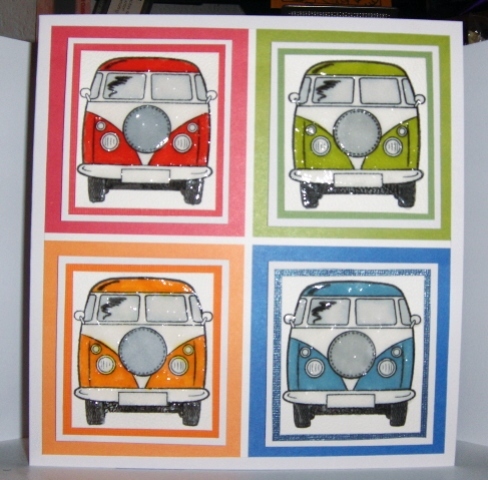 I stamped several images of the VW Camper then coloured the images in with Promarker pens. The VW was then coated in Glossy Accents and left to dry overnight. The images were then matted and layered onto co-ordinating card and paper stock and placed on a large 8 v8 x 8 card. 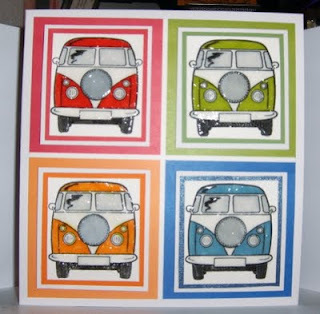 Am going to attempt a similar card with a VW Beetle - will post the results on here!